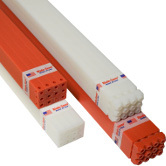 Our cutting sticks are formulated of a plastic noted for its resiliency, self-healing, and non-abrasive characteristics. These sticks will maximize your blade life without compromising the cut quality. Recommended for use with every grade of steel knife.